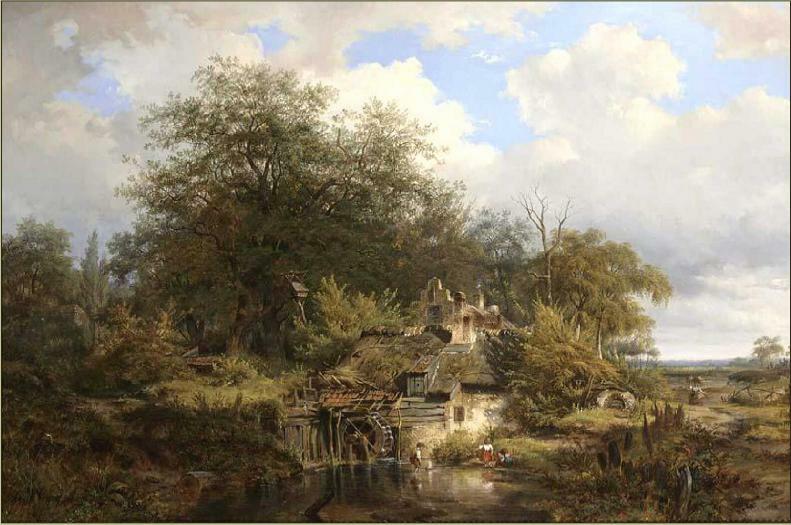 lijst van kunstschilders kunsthandel Galerie Trompenburgh. Johannes Gijsbertus van Ravenswaay was born in Hilversum in 1815. He was a pupil of his uncle, the Hilversum landscapist and animal painter Jan van Ravenswaay. 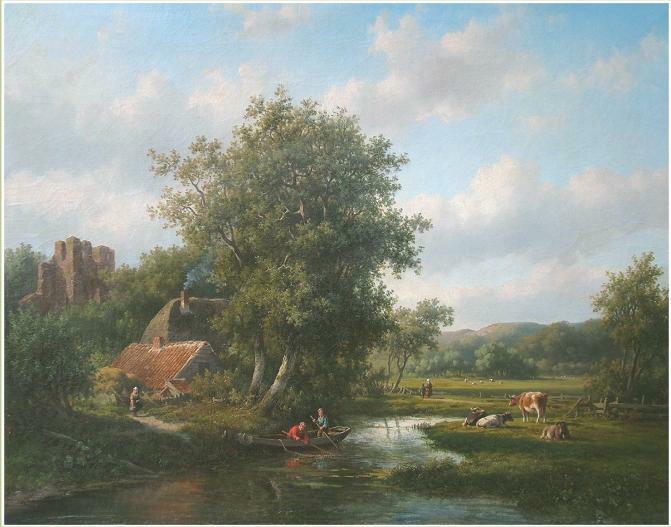 The rural surroundings of this small town in the centre of Holland with its golden buckwheat fields, oak forests and meadows with grazing cattle, attracted many landscape artists in the 19th century. Van Ravenswaay travelled to Germany to study nature. Struck by the overwhelming woodlands, he started to staffage his paintings with human beings reduced to a tiny scale, to make the landscape look even more impressive. Unfortunately van Ravenswaay's career was tragically cut short by his untimely death in 1849 at the age of thirty-four. This theme of the present lot has strong connotations with the work of the English painter John Constable (1776-1837), one of the greatest British landscape artists. Son of a prosperous corn merchant owning property with watermills, the young Constable was set to work at his father's business until he left for the Royal Academy in 1799. 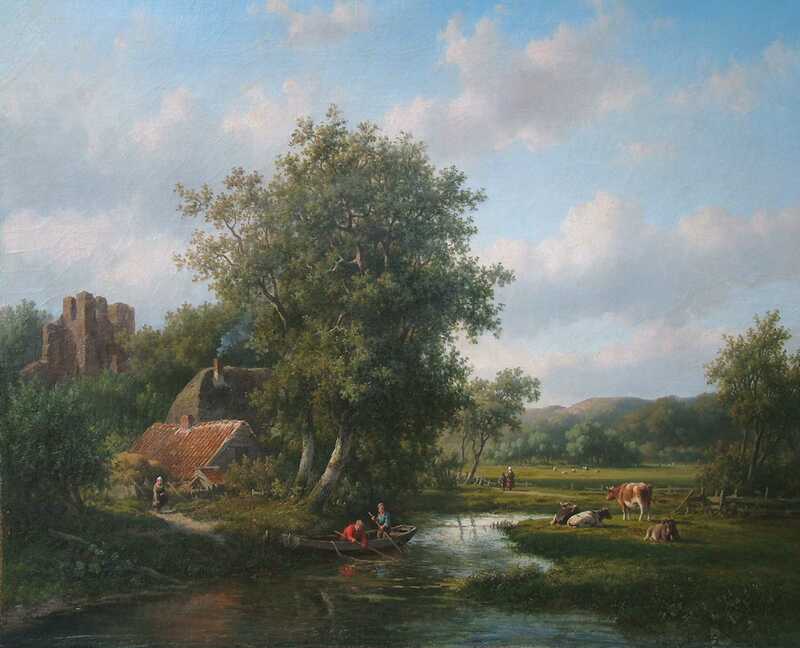 From the early 1820's onwards he developed his own original treatment to render scenery more realistically, modifying in an individual way the tradition inherited from Ruisdael in particular, the favourite Golden Age painter among the Romantic School artists. Constable was among the first to represent the atmospheric effects of changing light in the open air and the movement of clouds, as he truly loved nature. 'The sound of water escaping from mill dams, willows (…) I love such things. These scenes made me a painter.' Constable worked extensively in the open air, drawing and sketching in oils, but his finished pictures were produced in the studio. 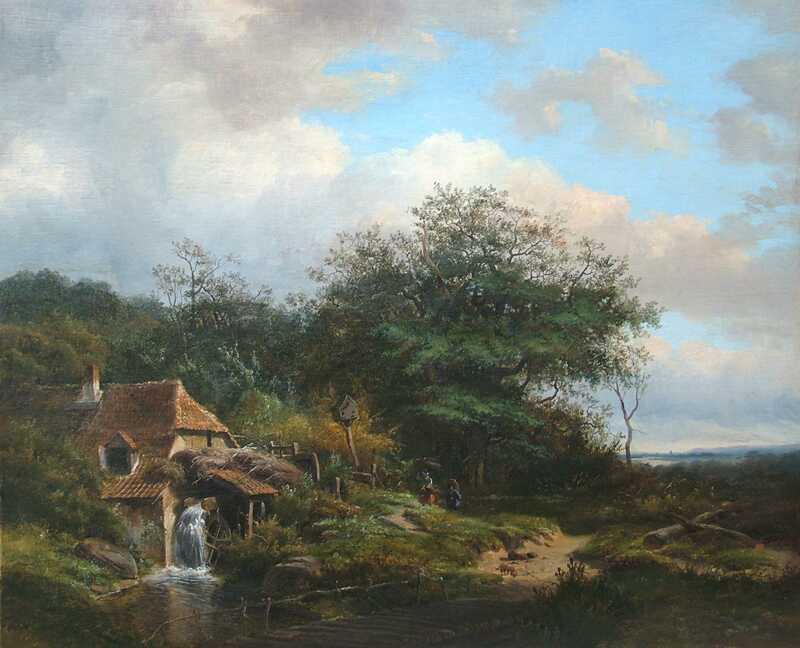 The water mill theme often appears in Constable's work as a remnant of his childhood. In the 1820's he painted Stratford Mill (1820), Parham's Mill, Gillingham, Dorset (1824) and an anonymous watermill in Dorset (1823-27). In his time Constable was well known in France, where he was a major influence on painters of the Romantic and the Barbizon School. He exhibited at the Paris Salon in 1825 and even at the Louvre, where his 'Haywain' excited the public and gained him a Gold Medal. It is not unthinkable J.G. van Ravenswaay was familiar with the work of Constable, as he was enthusiastically promoted by Delacroix and by the Barbizon School. The present lot is an excellent example of Van Ravenswaay's work. 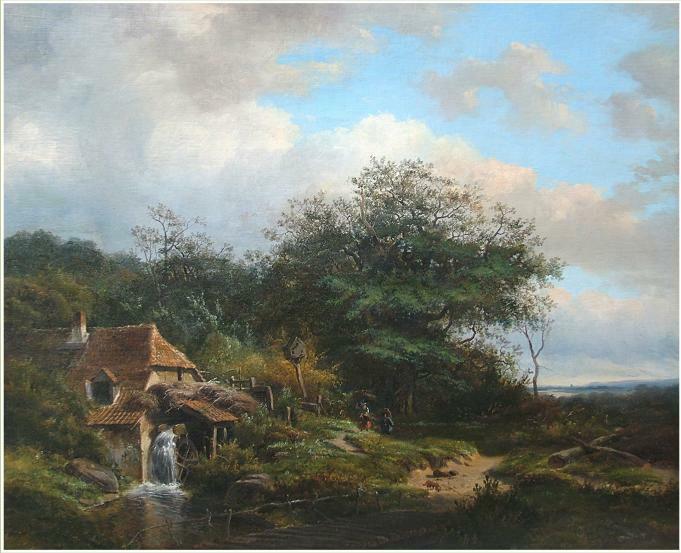 The rural, calm atmosphere, showing peasants so at ease with their surroundings and almost forming part of nature, shows the true romantic spirit of the artist.